I traverse broad corridors largely emptied over the past fifteen months to reach my goal, the company cafeteria. It is a scaled down version of what was, necessarily made smaller in response to a significantly dwindling population. However, today is different. Today, the space is filled with people. They are ravenous, cacophonous. A reduced kitchen staff is overwhelmed by customers for the first time in months. I patiently negotiate the throng and emerge with a meal. Seating is scarce and I seek a table with familiar faces amid the lunchtime horde. Ah! There they are. I move toward them. ...except that it is all wrong. Caught in recent corporate machinations, none of them belong there anymore. They are all gone and have been for months. I am the only one of the assembled cafeteria patrons who actually belongs in that place. But there is no room at the table for me. I awoke with a sense of suffocation. Rational thoughts ponderously spooled up, hindered by a dull headache. Ack. A headache on waking rarely foreshadows a good day. I laid still for a while as the mental fog cleared, ruminating on the not-so-subtle message my subconscious served up for me while asleep. Clearly, mental churn over recent developments continues whether consciously directed or not; latent processing in an effort to grasp new realities. I needed to clear my head and taking wing is one of the best ways that I know of. Warrior 481 has been stranded at ground level for the past two weeks due to weather and circumstance. As a result, I have, too. A brief flight would be good for both man and machine. I examined the sectional chart and located Hamilton Municipal (VGC), an airport southeast of Syracuse that I had never visited before. Perfect. Nothing clears the head like a bit of exploring. We launched from runway 10 as a nearly-direct crosswind blew across the pavement at ten knots, gusting to fifteen. As gusts slithered around the wings and fuselage from between the bordering trees, the Warrior wanted to fly prematurely. I held her on the ground a moment longer, aileron rolled partly into the wind, while airspeed built. With a sufficient airspeed margin, we broke ground and crabbed into the wind to track straight. I pushed the nose over to stay low, both to build airspeed and to prevent a slow climb through the turbulence likely present at treetop level. At 90 knots, satisfied, I pitched upward. As expected, the Warrior bucked and shuddered as we penetrated an invisible barrier above the trees, squawking the stall horn twice before we climbed above the mechanical turbulence. At 3000', Warrior 481 and I cruised to the southeast, crabbed 15° right of course to track true toward Hamilton. We were bumped around under a gloomy overcast, manhandled by the troposphere. Shortly after establishing two way radio contact with Syracuse, we were jolted so abruptly that my posterior momentarily departed the seat. I slowed the airplane (to protect her) and tightened the seat belt (to protect my noggin). I wondered if such a rough, uninspiring day would be good for the soul after all. I should not have doubted. When we reached the edge of the cloud ceiling, the landscape transformed. Gloom above was replaced with sapphire blue and the dirty beige winter world below became a gleaming, pristine wonderland. Emerald evergreens that had previously escaped my notice suddenly popped against the landscape, their branches accented artfully with snow. In the parting of the clouds, the world seemed to renew and my state of mind followed suit. It is truly amazing how a veil of cloud can color moods and landscapes alike. At 3000' and flying toward rising terrain, I noticed a few towers south of Syracuse rearing their metallic heads to significant heights. I located them on the sectional chart before the nearest triggered an obstacle collision warning from the GNS-430W. I watched it pass below and to the starboard; warning or no, we were beyond its reach. The Hamilton airport was well cleared of snow. We overflew the field 900 feet above pattern altitude and maneuvered for a 45° trajectory to the downwind for runway 17. We passed picturesque Lake Moraine, a reservoir created high in the hills overlooking the airport. On short final to runway 17, we overflew a pond, its surface rippling towards us in the strong, southerly wind. I countered sinking air over the pond by advancing the throttle and made a smooth, full stall landing directly on the runway numbers. The sky, the perfect landing, the exploration of a new place; they were all exactly what I needed that day. I took on fuel and spent a few minutes visiting with the friendly group of pilots hanging out in the FBO. I was offered a courtesy car to run into town for food, but I had eaten before leaving Sodus and declined. I was also offered a doughnut, which was something that I could not refuse. Hamilton Municipal seemed like a nice operation with plenty of life, even on a cold, blustery day. With up to twenty knots of wind on the nose, we climbed quickly away from the runway and turned out over the village of Hamilton. Ever dynamic, the cloud cover began to reassert itself. By the time we crossed the north end of a gunmetal toned Skaneateles Lake, the world was once again rendered in shades of gray. But that was OK, my time exploring under blue sky had already accomplished the goal. We entered the pattern for runway 10 at Williamson-Sodus. On a left base, the GPS groundspeed indicated 25 knots below the Warrior's airspeed. That was sure to diminish somewhat on final approach, but it hinted at a significant crosswind component for landing. 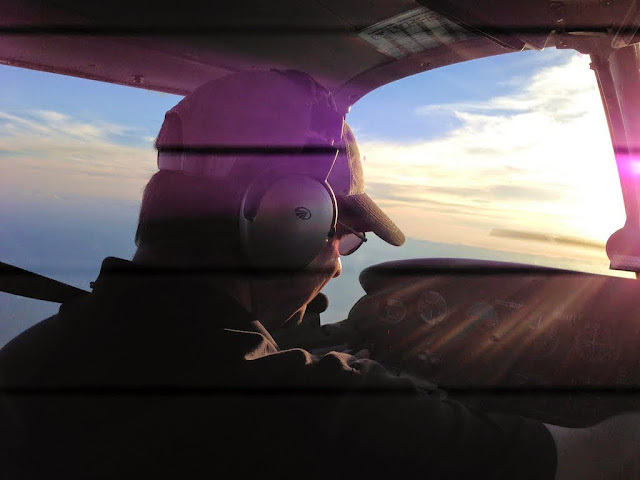 Cross-controlling the airplane into a slip, I tracked the center line and gently brought her back home. I would love to say that it was a perfect landing, but a strong gust carried us airborne again moments after making contact with the runway. The second time down was not so pretty. It was not a hard landing, but it was sloppy. You win some, you lose some. Regardless, my head was cleared. Somehow, I always return from the air fortified. Aeronautical exploration will not actually fix any real problems, but it always infuses me with confidence and clarity of purpose whenever I need it. On winter's edge with traces of snow accenting higher terrain, we circumnavigated Seneca Lake on a sightseeing cruise. At 38 miles long, Seneca is the second longest of New York's Finger Lakes. It is the largest in volume and, with a maximum depth of 618 feet, it is considered the deepest lake in New York State. With 75 miles of shoreline, Seneca Lake lies ribbon-like across the landscape. Once past Geneva on the north end of the lake, we proceeded south along the western shore as wine country passed below the Warrior's wings. Watkins Glen lies at the south end of Seneca Lake, known for its magnificent eponymous geological formation (and a race track or some such thing). From above, the actual glen is so narrow that it appears as little more than a crack in rising terrain. To the south, higher terrain appeared to converge with a broken ceiling through which sunbeams illuminated remnants of the season's first snowfall. To the east, with Cayuga Lake in the distance, snow remained in a state of tenuous equilibrium on higher elevation fields. Cayuga Lake, inscribed across the landscape in a twisting course not-quite-parallel to that of Seneca, is the longest of the Finger Lakes. Proceeding north along the eastern shore of Seneca Lake, we encountered a large airport. It was the former Sampson Air Force Base / Seneca Army Airfield, a closed military facility whose massive runway survives in apparently pristine condition despite years of neglect. At the northwest end, faded paint hints at the piano key and runway 16 markings that once existed there. Now, even the "X" painted across "16" to formally close the runway has faded to virtual nonexistence. Of the many closed gateways to the sky that litter upstate New York, this is one of the most magnificent. As emergency landing fields go, this one would serve more capably than most. An unusual pattern is etched across the adjacent land, remains of the former Seneca Army Depot constructed in 1941. It was a munitions storage and disposal facility made up of an array of concrete "igloos". Some of these igloos once stored radioactive materials from the Manhattan Project, which strikes me as a curious use for prime farm land tucked between the two largest Finger Lakes. I concluded the flight with a few practice take-offs and landings in a moderate crosswind at Williamson-Sodus. Satisfied, I stowed the Warrior away in her hangar until our next flight together. Much like the Air Zoo in Kalamazoo, MI, the Owls Head Transportation Museum in Maine formed in the 1970s as a "plausible excuse to fly old airplanes". But the museum has since developed into a transportation museum in the fullest sense with a collection that appeals to aviators as well as those preferring more two-dimensional means of transport. It is a fantastic museum featuring golden age era aircraft, many in airworthy condition, and an even greater array of vintage automobiles, motocrycles, and bicycles. It was a very worthy excuse for my recent flight to Maine. The museum is on the field at Knox County Regional Airport (KRKD). Although there is nothing preventing fly-in visitors from taxiing directly to the museum, the museum prefers that visitors park on the main ramp. A ride to the museum can be had with a phone call. The first aircraft I encountered was this 1917 Curtiss JN-4D, otherwise known as the "Jenny" (why is it that I always hear Forrest Gump's voice in my head when I say that?). In 2005, Kristy and I landed at Souther Field in Americus, Georgia (now Jimmy Carter Regional Airport, KACJ) and found a plaque proclaiming that Charles Lindbergh did his first solo from the field in a Curtiss Jenny. Jennys were used as trainers in World War I and are considered America's first, commercially successful, mass produced airplanes (which probably drove the Wright Brothers absolutely crazy). If I understood correctly, this Curtiss OX-5 engine will soon be on its way Le Roy, NY for overhaul. This ornithorpter, built by James Clark of Bridgewater, PA around 1900 is one of the more curious "aircraft" on display. A five horsepower gasoline engine made the wings flap. It never flew, but I bet it could shake the fillings out of your teeth. A graceful monoplane, this 1913 Etrich Taube was nevertheless a mass of wires that provided aerodynamic control through wing warping. Presumably, Igo Etrich was not concerned about being sued for patent infringement by the Wright brothers. Despite the fact that this is a very real airplane, something about its birdlike form festooned with control cables struck me as being the stuff of fantasy. The steering wheel seems awkwardly incongruous on such a graceful airplane. Taube is the German word for "dove", a symbol of peace. Ironically, the Taube was the first military airplane mass produced in Germany and the first airplane used for dropping bombs. This is the only known flyable example of a Taube in North America. The shape of the wings was inspired by the zanonia tree seedpod because of a theory that it was the perfect aerodynamic form (only zanonia seedpods aren't bristling with wires). Just look at that magnificent propeller! It is attached to a 1923 Fokker C.IV that was originally built in Holland. The pilot sits in an open cockpit immediately aft of the wing, but the rest of fuselage accommodates passengers. Records indicate that it was converted to a passenger aircraft in a Seattle auto body shop. The whole "Tacoma to Tokyo" scheme (note the paint job) was evidently a bust. If this 1918 Standard J-1 resembles a Curtiss Jenny, it may have something to do with the fact that Standard once built Jennys under contract. This J-1 was their "better" version of the Curtiss design. However, most Standards finished World War I still in their crates once it was discovered that the original Hall-Scott engines used by Standard had a penchant for breaking fuel lines and catching fire. For some reason, this made them unpopular. Post-war, Standards could be purchased cheaply (fire sale?) and, when fitted with different engines (typically 150 hp Hispano-Suiza or "Hisso" engines), they became quite popular with barnstormers and as platforms for wing walkers. The 1909 Bleriot XI was the first successful tractor monoplane. It was at the controls of a XI that Louis Bleriot achieved fame for conducting the first flight of an airplane across the English Channel. The museum's Bleriot is a reproduction. Prior to invention of the gun synchronizer, firing machine guns through a spinning propeller was a significant challenge in World War I. This Royal Aircraft Factory F.E.8 solved the problem with a pusher engine arrangement. Once the gun synchronizer came into use, however, the aircraft was removed from service and all examples destroyed by the British government. This aircraft is a reproduction from original plans built by two California men. In 1980, one of them (it is a single seat aircraft, after all) flew it to Owls Head using only a compass for navigation. 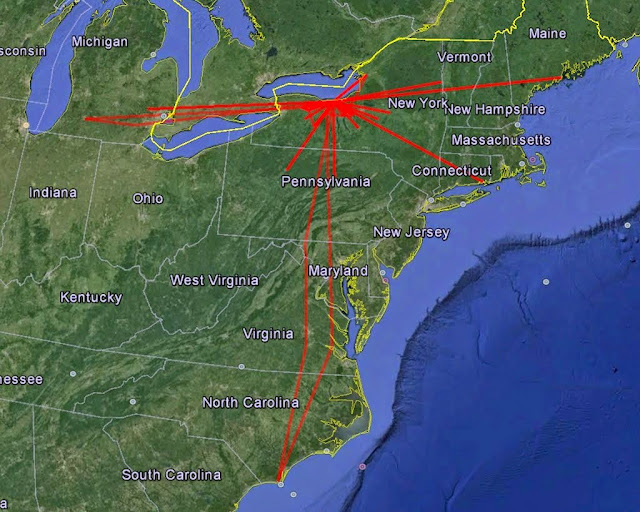 At an average speed of 80 mph, this journey required 57 hours of flight with 61 stops. Although the original aircraft would have used a Gnome rotary engine, the reproduction uses a modern six cylinder air cooled Continental. The 1912 Curtiss Model D Pusher was one of the first aircraft to employ ailerons for roll control. This was done to avoid wing warping, thus circumventing the Wright brothers and their litigious ways. It must have worked; we still use ailerons today. This Curtiss Pusher is equipped with a modern four cylinder air cooled engine. This 1930 Speedwing D-4000 was one of the last racing airplanes built by the Travel Air Company. This is a relatively rare airplane with only 15-20 ever built. It is a relative of the Travel Air biplane I once flew over the southern California coastline. The founders of Travel Air, Clyde Cessna, Lloyd Stearman, and Walter Beech went on to create their own individual legacies in aviation. I love the paint job on this 1917 SPAD XIIIC.I. It's probably not particularly good camouflage, however. Here is what I love about the Owls Head Transportation Museum: In most museums, a 1941 Stearman biplane might be the elder statesman of the collection. Not at Owls Head. Compared to the pre-World War II aircraft dominating the collection, the Stearman looks positively modern. There are other curiosities at the Owls Head Transportation Museum that do not fly. This 1909 Pierce motocycle was built by the Pierce Cycle Company of Buffalo, NY. Pierce also made magnificent automobiles such as the Pierce Arrow (several examples of these can be seen at the Gilmour Car Museum near Kalamazoo, MI). A steam powered 1904 Stanley Model B Runabout. How do you prefer your H.C.S. Touring Car? Restored or unrestored? Here's a curious vehicle with an aviation link: the 1935 Stout Scarab. William Stout, of course, significantly influenced the design of what became the Ford Trimotor (talk about a stout airplane!). Only nine Scarabs were ever built. For its time, this car must have seemed incredibly futuristic. A 1916 Scripps-Booth Model C, which was partially designed by William Stout. Elegant. This is a Chevy. In a few short decades, it would evolve into that pinnacle of automotive design: the Chevette. Calling all BMW snobs! This egg-shaped, three wheeled 1958 BMW Isetta 300 helped save the car manufacturer from economic failure in the late 1950s. Believe it or not. A nice looking 1932 American Austin Roadster. This gorgeous fire engine is the marriage of a 1904 steam powered pumping engine (American Manufacturing Company) with a 1918 American LaFrance tractor. This photograph does not do the beast justice - the chrome alone was worth the price of admission. This is a ca. 1850 coach built in Concord, NH. Though most of us associate these coaches with the Wild West, they originated on the East Coast. The Concord Coach had a unique suspension of leather braces that cradled the coach on the chasis, giving a smoother ride than a leaf spring suspension. An early "crotch-rocket", a 1913 Excelsior Model C7 motorcycle. This 1920 Buick is one of the few models that I'm sure my grandfather never owned. I tried not to take of picture of this REO, but decided that "I can't fight this feeling anymore." REO, of course, stands for Ransom E. Olds and the REO Motor Car Company of Lansing, MI was the second automobile manufacturer to carry his name. Does anyone remember the Fabulous Hudson Hornet from Cars? Here he is, in the "flesh". An elegant hood ornament and the snazzy Packard to which it is attached. In this example, the ever-versatile Ford Model T was transformed into a snowmobile using a commercially available conversion kit devised in West Ossipee, NH. This is only a small sampling of what the wonderful Owls Head Transportation Museum has to offer. I learned a lot about both early airplanes and early automobiles. This is a nice facility that still operates many of its vehicles, flying and rolling alike, and maintains them in excellent condition. I highly recommend a visit.